The historic Hawthorn-Clabaugh-Patterson House is now the location of the Carthage Chamber of Commerce. Anderson Park is located in the center of downtown Carthage. The Esquire Theater in Carthage hosts Country music on Saturday evenings. An African American community lived in Carthage from East Panola to Live Oak streets from 1940 to 1965. Carthage was founded in 1847, two years after Texas became a state. During the Civil War, men from Carthage and Panola County served as Confederate soldiers, while one resident, Milton M. Holland, earned a Medal of Honor as a Union sergeant. After the war, population growth was slow, but large amounts of cotton, corn, sweet potatoes, oats, and sugar cane were produced in the county. The city began to grow in 1888 when a railroad reached Carthage, along with telegraph and telephone lines. During the Great Depression, a gas field was discovered near Carthage. After World War II, this gas field was developed and proved to be the largest in the United States. The city flourished, with the population increasing from about 1,300 to 5,000. During this period, a courthouse was built, along with a high school, and Panola County Junior College was founded and built in Carthage. KGAS-(AM) Radio began broadcasting from the city in 1955. The growing population also brought the establishment of the Panola General Hospital. August 22, 1998 was Carthage's grand opening for the Texas Country Music Hall of Fame. 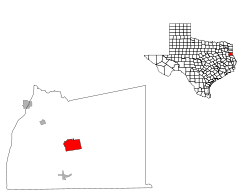 According to the United States Census Bureau, Carthage has a total area of 10.5 square miles (27 km2), of which 10.5 square miles (27 km2) is land and 0.04 square miles (0.10 km2) (0.4%) is covered by water. As of the census of 2010, 6,779 people, 2,628 households, and 1,745 families resided in the city. The population density was 645.6 people per square mile (249.2/km²). The 2,909 housing units averaged 277.0 per square mile (106.9/km²). The racial makeup of the city was 69.5% White, 21.1% African American, 0.5% Native American, 0.7% Asian, 6.5% from other races, and 1.7% from two or more races. Hispanics or Latinos of any race were 11.0% of the population. Of the 2,628 households, 29.8% had children under the age of 18 living with them, 45.6% were married couples living together, 16.4% had a female householder with no husband present, and 33.6% were not families. About 30.5% of all households were made up of individuals, and 14.8% had someone living alone who was 65 years of age or older. The average household size was 2.45 and the average family size was 3.04. In the city, the population was distributed as 24.6% under the age of 18, 11.2% from 18 to 24, 23.9% from 25 to 44, 24.1% from 45 to 64, and 16.3% who were 65 years of age or older. The median age was 35.9 years. For every 100 females, there were 88.3 males. For every 100 females age 18 and over, there were 83.8 males. As of the 2000 Census, the median income for a household in the city was $31,822, and for a family was $37,031. Males had a median income of $33,080 versus $21,473 for females. The per capita income for the city was $16,332. About 11.8% of families and 13.2% of the population were below the poverty line, including 15.2% of those under age 18 and 12.9% of those age 65 or over. The City of Carthage is served by the Carthage Independent School District. Also, the two-year Panola College, a community college, is located across from Carthage City Hall. The Texas Country Music Hall of Fame is located in Carthage, which also houses the Tex Ritter Museum. The Jim Reeves Memorial is located just on the outskirts of Carthage, east on U.S. 79. Reeves and Ritter were from the nearby unincorporated communities of Galloway and Murvaul, respectively. The Footprints in the Sand monument is a 14-foot bronze sculpture of Jesus carrying an old man depicting the famous poem. It is located on the southwest loop in Carthage. Carthage resident Bob Harness is the sculptor. The old Panola County Jail Museum is located on North Shelby Street. 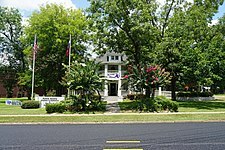 Panola County Heritage Museum is located at 100 East Sabine Street across from the gazebo in downtown Anderson Park. Lake Murvaul is 15 miles west of Carthage on Murvaul Bayou. Margie Neal, newspaper publisher and first woman elected to Texas State Senate; a Texas Historical Marker in the center of town recognizes her achievements. Carthage is served by two local radio stations: KGAS 1590 AM and KGAS 104.3 FM, and by a local newspaper, The Panola Watchman. The nearest media market of notable size is in nearby Shreveport, Louisiana. The film Bernie is a fictionalized account starring Jack Black, based on the infamous Carthage murder of an 81-year-old resident, Marjorie Nugent. In November 1996, Bernie Tiede shot Nugent in the back four times with a .22 rifle. Having previous experience as a mortician, he cleaned the body and placed it in a freezer in her house. Tiede continued his community involvement until he was brought in for questioning. In fact, he admitted to attending a Panola College theater rehearsal the same night he shot Nugent. Tiede fabricated continual lies to cover questions about Marjorie. When suspicions began to grow with the city's residents, her family who lived out-of-town .filed a missing-person report. Nine months after her death, Tiede was finally brought in for questioning and confessed to the murder. He was sentenced to life in prison. He was released from his life sentence on a $10,000 bond in 2014. But in 2017, Bernie Tiede was resentenced to 99 years to life. The climate in this area is characterized by hot, humid summers and generally mild to cool winters. According to the Köppen climate classification system, Carthage has a humid subtropical climate, Cfa on climate maps. ^ O'Neal, Bill (2009). Images of America: Carthage. Arcadia Publishing. pp. 7–8. ISBN 978-0-7385-7112-6. ^ "ETMC Carthage - ETMC". ETMC. ^ "BLACK SOLDIER WAS FIRST NATIVE TEXAN TO RECEIVE MEDAL OF HONOR". Texas Almanac. Texas State Historical Association. Retrieved 3 January 2018. ^ "NEAL, MARGIE ELIZABETH". tshaonline.org. Retrieved 14 September 2015. ^ "Texas Historical Marker – Margie Neal". 9key.com. Archived from the original on 1 November 2015. Retrieved 14 September 2015. ^ Perry, Ryan. "The Killer Inside Him: The Bernie Tiede Story". Behance.